In 1984 at Fellowship Bible Church of North Little Rock (as it was called then) the available times to meet were quite limited. We had Sunday Morning services and Community Groups which met every week. Sometime later, there were a number of women who were not working and wanted a midweek Bible study that would meet during the day. Jane Pounders was appointed to lead the women’s group and asked me to be in charge of a night group with Nina Foster. I believe we only met once a month and did not have small groups like we have now. We did, however, have a theme and different women from the church led a prayer time, a Bible study on the theme and a very talented refreshment group led by Judy Noah. We always met at Marion Millet’s home which is now known as the Loibner’s. The second year’s study was “Fruits of the Spirit”, with seven months of talks by different women. Nina and I, ever the brave (or foolish) ones, decided to have a Christmas banquet at the soon to be FN church. It was still occupied by First Pentecostal, but they were eager to work with us in any way possible. The theme for the banquet was “Fruits of the Spirit Meets the Spirit of Christmas. The dishes were rented, the food was prepared in the old kitchen and the dining area was decorated to perfection by Sandra Clary and Tensie Pottoff. To top it off, the men served and cleaned up. One Hundred women paid $5.00 each to attend. In the beginning, there was GOD. He led us through many uncharted waters, but never failed to provide a reliable boat. Many of the women who were there at the beginning are still worshipping at FN. Some, like Tensie and Marian, have gone on to be with Him, but have left a great legacy in their wise daughters and grandchildren. He gave us visions for the future and memories of the past. The best memory for me was that first banquet. Today’s story is by Carole Grant. 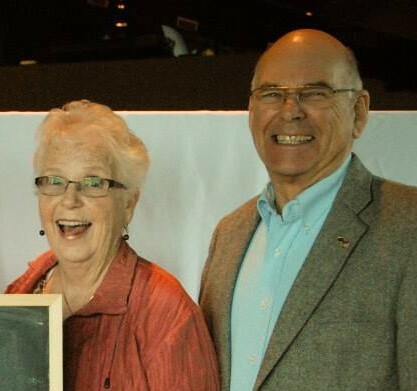 Carole and her husband, Jim, have been at Fellowship North since the very beginning. When they’re not out on a traveling adventure, you can usually find them behind the coffee bar in the lobby on Sundays.